Opening Doors: Federal Strategic Plan to Prevent and End Homelessness set a bold and audacious goal to end Veteran homelessness in the United States before the end of 2015. Over the last three years, the Obama Administration and our partners in states and communities across the country have achieved a 24 percent decrease in homelessness among Veterans, during a time when our country was facing the worst recession since the Great Depression. Several communities, such as Phoenix, Salt Lake City, Houston, New Orleans and others are already on track to meet or beat this goal. On June 4, 2014, as part of the Joining Forces initiative, First Lady Michelle Obama announced that a growing coalition of mayors, governors, and county officials are committed to ending Veteran homelessness in their communities by the end of 2015, and called on additional mayors and local leaders to join this effort. Through the Mayors Challenge to End Veteran Homelessness, mayors and other state and local leaders across the country will marshal Federal, local, and nonprofit efforts to end Veteran homelessness in their communities. Ending Veteran homelessness means reaching the point where there are no Veterans sleeping on our streets and every Veteran has access to permanent housing. Should Veterans become homeless or be at-risk of becoming homeless, communities will have the capacity to quickly connect them to the help they need to achieve housing stability. When those things are accomplished, our nation will achieve its goal. 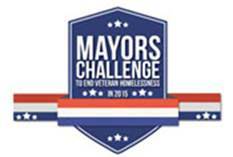 To publicly commit to ending Veteran homelessness in your community and learn more about joining the Mayors Challenge, send an email to mayorschallenge@hud.gov and visit http://bit.ly/mayorschallenge. Q. Why should a mayor join the Mayors Challenge? A. As laid out in Opening Doors, our nation’s first strategic plan to prevent and end homelessness, we have a goal as a country to end homelessness among Veterans in 2015 – less than two years from now. And, thanks in large part to the progress we have made over the last four years, we are seeing unprecedented levels of federal commitment and investment in programs for Veterans experiencing homelessness. B. However, we know that we will only end homelessness nationally by ending it locally – something that requires the continued leadership and support from mayors and other local elected officials. C. By publicly committing to ending Veteran homelessness in 2015, mayors will lend a powerful voice to their communities’ collaboration and efforts, enabling them to build momentum to reach the finish line. Previous story Can You See Me?